We welcomed London Wayfarers to TD for what promised to be an entertaining encounter between two good sides. The visitors sat just out lucrative 4th and final automatic promotion spot. Buoyed by a comprehensive away victory last week, which took us back to the top of South Prem, we started at a blistering pace. Wayfarers Press was easily negotiated by the defensive line and Will Phillips controlled the game from centre half. Croker, Murphy and Wilson all went close to the giving us the advantage but we found an opposition keeper in inspired form. In the 28th minute the deadlock was deservedly broken after a nicely worked short-corner routine was expertly finished by Jack Smart – his 4th of his inaugural season with OC’s. After the deadlock had been broken, we failed to make the most of a constant wave of attacks down both flanks and we could only had a single goal advantage by half time. In the second half Wayfarers changed their press and looked to pressure the ball higher up the pitch. The game turned in to a cagey affair with the majority of the game being played in the midfield. We were in debt to their keeper, Josh Doble, who produced a good double-save from a Wayfarers short corner. This had been the Battersea side’s first chance of note in the game. We began to weather the storm following a period with only 10 men and began to open gaps down the left side. A quick attack in the left channel found Paddy Harman who squared the ball to Ben Wilson. 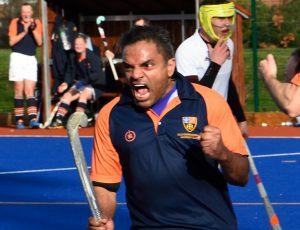 Much to the jubilation of the home crowd, he produced an excellent first-time reverse-stick finish. Wayfarers continued to press the OC’s defence but failed to test Doble until five minutes from time when the ball found its way through the normally unbreakable defensive partnership of Laidman and Davies. A lifted finish over the stranded Doble presented a nervous finale, but we managed the game well and saw out a relatively tame rally from the visitors. The victory sees us continue their unbeaten run in 2019. With a two-point advantage at the top of the table, we travel to bottom side Henley, a team who have proved to be a bogie team for this talented squad. The treble in still very much on. We played out another very good game against a good Wanderers outfit and 2 excellent umpires provided by the oppo. 1 up after a few minutes, 2-1 down at half time and about to self destruct and scoring the winner 20 seconds after the oppo drew level with a few minutes to go. Quelle drama! Speaking of drama, yours truly had his drama queen moment which led to getting DoD and the penning of this nonsense rather than from our usual author who, I can only assume, was dropped but for undisclosed reasons and found himself playing a standard of hockey that is arguably more suited to someone of his age. There were others missing too. Packers deeming that a game of tennis was far more appealing than a trip to the salubrious delights of Kennington, Dazzler and Cato fancied a game 10 mins down the road in Battersea at 4pm, Jonny “I’m available all season” Hunter, Dan who probably didn’t want to take MoM off the regulars this week and our “new” skipper who fancied watching some dreadful cricket in Barbados. So yes, the first of our jaunts up to Kennington, at least it wasn’t snowing. Only Kenty struggled to find the ground just about making it for the start. Slightly more worrying was that West Sussex Eds is able to track Kenty on his phone – quite why the former skipper wants to know the whereabouts of players on his phone is anyone’s guess. Lewi led us for a quick 5km run followed by an audition for entry to a tough mudder event and a lacklustre on pitch warm-up….so far so normal. We expected Wanderers to come at us from the off however it was us that scored first after a neat bit of skill, strength and perseverance (he completely lost control of the ball and stumbled his way through several robust challenges) from our Lidl Scott who made his first appearance of the year. 1 up inside 3 minutes, and some prophetic words from the stand-in skipper. 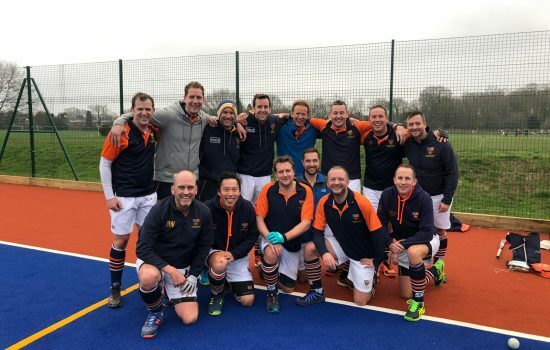 “That’s probably not the start we needed as now we’ll think it’s too easy” Wise words from someone who’s played at almost every level of Surrey league hockey over the years and seen it all. Wanderers turned on the style throwing lots of unnecessary aerials which were in the main dealt with well by the back 4 of Charlie, Heardy, Ports and included one outrageous leap and take down of the ball by MoM Diggers in the second half. I’m pretty sure he was looking over his shoulder the wrong way as he leapt backwards and somehow picked the ball out of the air on his reverse stick. Anyway, Wanderers scored twice, the first from a short corner I think, the other from a p-flick as Rosco was deemed to have tickled the oppo forward to the ground as he was going away from goal. He then calmly slotted the p-flick under Rosco who could probably have gotten back up and had another go at saving it but instead wanted to make a game of it. The half time talk was – interesting – the stand in skipper not holding back in shouting his displeasure at the antics of the first half. God help any of Kiki’s boyfriends if they show similar antics when she’s older. But the message was clear and we started the second half strongly passing the ball and playing “our game”. We scored twice through Hugo and Charlie and then started asking how long was left. Oh dear oh dear. A Wanderers short corner was given immediately followed by Avo proclaiming “don’t worry they’ve got nothing at shorts”. He’s clearly not seen it all in the Surrey leagues. Within 20 seconds of the restart we were suddenly back in the lead again as Kenty slotted in following a run straight through the spine of the Wanderers defence. Astonishing scenes as we then did whatever it took to run the final minutes down which seemed to include 10 minutes of extra time. Relief at the final whistle a potential banana skin avoided and the added bonus of Old Reigations doing us a favour turning over Barnes 2s thus returning us to the top of the league. So it’s back in our hands with some tricky games coming up. But hopefully we won’t have to see the West Sussex hair-dryer in use again this season. 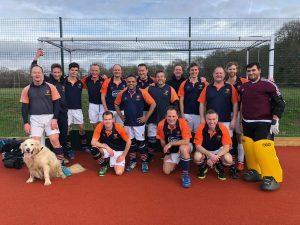 Guildford 2-4 4th XI A magnificent 4-2 home victory against high-flying Guildford sets us up nicely for a shot at promotion. We’re just four points off second place Leatherhead who we play in two weeks time. But before we all get too ahead of ourselves, let’s remember the manner of our victory. Whizzer’s passing masterclass made us all look like champions! The game was evenly balanced at half time at 1-2 with two unstoppable solo efforts from the Guildford playmaker cancelling out a Whizzer special with nice assist from Tom. Second half, Howie man-marked their playmaker stifling their possession and we began to dominate scoring three unanswered goals to seal a well-earned victory. Disappointingly, for the second week running out opposition decided they were unable to raise an XI for a scheduled match, surprising news given the size of the club concerned. Kieran deserves better for the bard work he is putting into getting XIs out for this new venture. 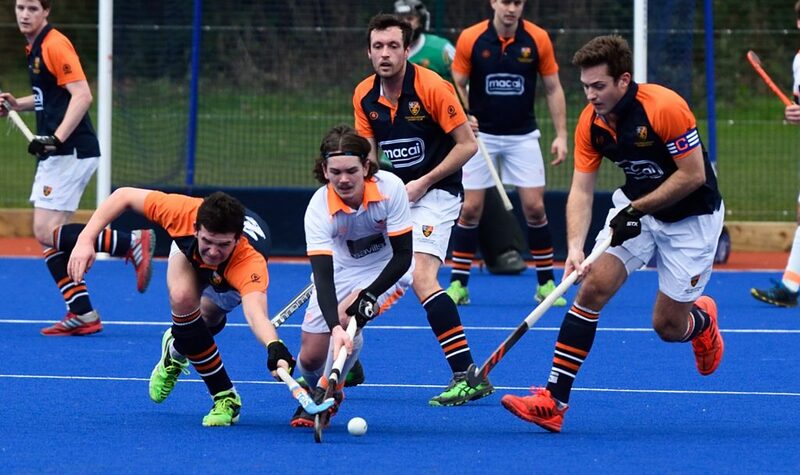 One cracking game of hockey from both sides. Match report to follow. 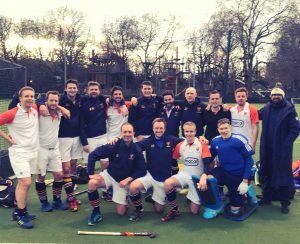 A late start at Battersea Park following the overrunning 2s match but an inspirational work ethic was on show for the watching Barnstormers as a late penalty stroke earned the Mens 2s a well deserved draw. Unfortunately we were unable to equal this in the ensuing match, largely through being on the wrong side of the bounce of the ball rather than shortfall in effort. Another cancelled 3A fixture led again to swollen Stormers ranks and we fielded a full 16 on Saturday, somewhat top-heavy causing Closey and latterly Toby to drop back to bolster the defence and leading to much rotation of the forward pair, superfan Ross running the bench as well as possible. At least one of the subs was warm in the club’s new bench-coat. Si Duncan eschewed its use given he would have become invisible. Much of the first half was evenly balanced. Wayfarers were a more than competent side when they want to play. We had more than our share of possession though and created chances and penalty corners but – as was the story of the day – were unable to convert any of them. We stuck to the game plan, seeking to exploit the flanks and several sorties around the back from Big Gav (sporting a retro OCs away strip not seen since circa 1986), Charlie and Cato led to shots, saves and more than a polite number of misses. Scoreless at half-time the view was that our superior legs would tell as time wore on. Much end to end hockey followed. The neutral umpires from the prior game had been persuaded to stay on and, whilst they took a while to adjust to our level (under-estimating how we wanted the game to be adjudicated), some authority was then stamped on the bad tackles and (generously) professional behaviour, earning a green and yellow for the home side and, seeking not to be outdone, something of a running discussion with Kirky, who is still apparently seeking an apology. More chances at either end and misses all round with the pick of the bunch falling to Poen who, on another day, would have had a hat-trick. Bodies on the line in defence will also mean some ugly bruises for Eastie and Cato among others this week. Typically of course a rare Wayfarers attack and speculative crash ball caught a deflection and claimed the only goal of the game, ruining Nigel’s clean sheet record and spoiling all of our weekends. Other results at the top of the table means we slip to third at the time of writing and badly need to steady the ship at OKs next week. Old Cranleighans Ladies 1s were looking forward to their first home game since before Christmas. It was going to be a tough match, playing Oxted Ladies 1s who were currently sitting at the top of the table but the OCs team arrived focused and ready to put in a good performance. After a motivating team talk from the coach, the team felt determined to pull together and have a good match. OCs started well, attacking strongly and most of the play was in Oxted’s defensive half. OC’s created a few chances but were unable to convert these into much-needed goals. 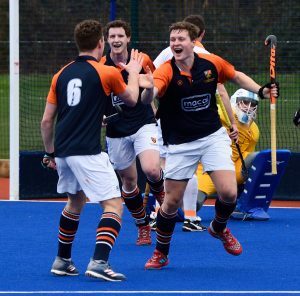 Oxted had the opportunity to make a couple of breaks, with some good passes into the D and making the OCs defenders and goalie work hard to keep the ball out of the OCs goal. However, OCs continued to apply the pressure and Rosanna Hall managed to convert a cross from Georgie Sangster shortly before half time. Half time brought another focused talk from the OCs coach. 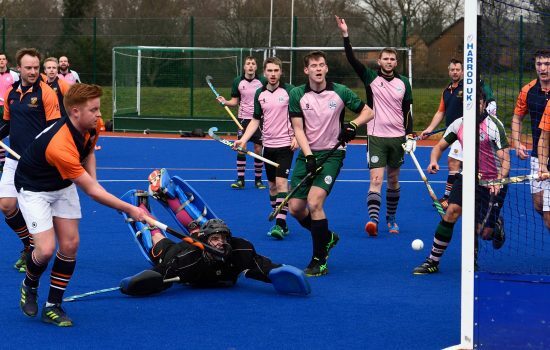 The team were aware that the opposition were going to come back strong in the second half but OCs were determined to hold onto the lead they had created. The second goal came shortly after half-time from a short corner from a massive strike from Georgie Syms which was caught by an Oxted defender’s stick but reached the back of the net to make it 2-0 to OCs. Oxted were by no means giving up at this stage, continuing to regroup and break through OCs defence. At one point, Oxted found a hole through OC’s defence, leading to a one on one with OCs goalie who had to come out to meet the oncoming Oxted attacker and managed to reach the ball with an outstanding stretch to maintain a clean sheet. The third goal came from some excellent play from Jackie Waite down the left hand side, passed to Katie Richards and onto Georgie Syms who scored again to give a 3-0 lead to OCs. The team were feeling confident now but were aware that they needed to remain focused and dig deep for the remainder of the second half and Oxted were still determined to even up the scoreline. 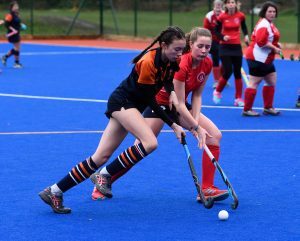 However, OCs continued to apply pressure and make the most of opportunities, with Georgie Sangster remaining calm in the D and managing to control the ball to score OC’s fourth and final goal of the match. A fantastic and much-deserved win for the Ladies 1s. Every side has an off day and this was ours. Against an OK side who pressed hard throughout, we failed to play our natural game and as a result found ourselves under the cosh for long periods of the match. That we came away with a point was a bonus, although we left it late to get out act together. The first 25 minutes were fairly even with both defences snuffling out any attacking threat. We did get the ball in the goal but it was disallowed for a foot in the build-up, but otherwise chances were few and far between. OKs upped their game in the final minutes of the half but despite seven consecutive short corners were unable to muster a serious shot. The second half was largely dominated by the OKs, our defence holding firm despite some wobbles, with our attacking forays limited to a handful of breakaways. The pressure told and with 15 minutes remaining OKs took the lead with a messy goal after we missed several chances to clear our lines. They maintained the pressure and won a flick with three minutes left, a good save by Nikki rebounding to a forward whose shot was stopped by Emma’s body. But Nikki dived to her right to save the flick and suddenly we woke up and for the first time really took the game to the OKs. Their hitherto excellent defence wobbled, and with 17 seconds remaining we won a short corner. Time ran out as we won two more corners, and from the third Kara Wiseman rifled a cracking shot inside the post to earn a draw. OKs were left wondering how they failed to win a match they largely dominated, while we were delighted at the escape from jail, even if the overall performance was disappointing. But we showed the value of battling to the end and the worth of an excellent team spirit. Despite the novice management, the Vamps took to the field with determination to face the challenge of an Oxted side with whom they had drawn in a close fought battle earlier in the season. It was always going to be a competitive match and so it proved with end to end play leading to chances for both sides. But the Vamps showed their grit, playing with heart and passion, persistence and a smidgen of intelligence. Number 14 was mostly kept under control by a tireless midfield, especially those with gazelle like long legs. The positioning and stubborn tackling of the defence held Oxted at bay and the passing was decisive enough to give impetus to the attack. Amy, the newest asset to the forward line, demonstrated skills and ball holding rarely seen in the Vamps. Persistence got its reward when, somehow, Katherine managed to loop a strike under the bar, putting Vamps into the lead at half time. But, as the umpires pointed out, it is a game of two halves and, girding their loins as politely as possible, the defence redoubled their efforts to defend the slim lead against a second half tsunami unleashed by Oxted. Remarkable double saves by Hannah, Kate taking one on the head and impressive interceptions by Fiona gradually broke Oxted’s will. An increase in attacking play sent their number 14 into defensive mode and the forward impetus of the whole team turned the tide of the match. In the final quarter Vamps dominated and were finally rewarded with a “it was there and then it was in” goal from Kim. A magnificent all-round team effort and deserved 2:0 win. Player of the match: For positioning, anticipation, timing and reading of the game that demonstrated a level of brilliance that was magnificent to watch – Fiona.